A drive shaft, driveshaft, driving shaft, tailshaft (Australian English), propeller shaft (prop shaft), or Cardan shaft is a mechanical component for transmitting torque and rotation, usually used to connect other components of a drive train that cannot be connected directly because of distance or the need to allow for relative movement between them. The term drive shaft first appeared during the mid 19th century. In Stover's 1861 patent reissue for a planing and matching machine, the term is used to refer to the belt-driven shaft by which the machine is driven. The term is not used in his original patent. Another early use of the term occurs in the 1861 patent reissue for the Watkins and Bryson horse-drawn mowing machine. Here, the term refers to the shaft transmitting power from the machine's wheels to the gear train that works the cutting mechanism. In the 1890s, the term began to be used in a manner closer to the modern sense. In 1891, for example, Battles referred to the shaft between the transmission and driving trucks of his Climax locomotive as the drive shaft, and Stillman referred to the shaft linking the crankshaft to the rear axle of his shaft-driven bicycle as a drive shaft. In 1899, Bukey used the term to describe the shaft transmitting power from the wheel to the driven machinery by a universal joint in his Horse-Power. In the same year, Clark described his Marine Velocipede using the term to refer to the gear-driven shaft transmitting power through a universal joint to the propeller shaft. Crompton used the term to refer to the shaft between the transmission of his steam-powered Motor Vehicle of 1903 and the driven axle. The pioneering automobile industry company, Autocar, was the first to use a drive shaft in a gasoline-powered car. Built in 1901, today this vehicle is in the collection of the Smithsonian Institution. Most of these vehicles have a clutch and gearbox (or transmission) mounted directly on the engine, with a drive shaft leading to a final drive in the rear axle. When the vehicle is stationary, the drive shaft does not rotate. Some vehicles (generally sports cars, most commonly Alfa Romeo or Porsche 924/944/928 models), seeking improved weight balance between front and rear, use a rear-mounted transaxle. In some non-Porsche models, this places the clutch and transmission at the rear of the car and the drive shaft between them and the engine. In this case the drive shaft rotates continuously with the engine, even when the car is stationary and out of gear. However, the Porsche 924/944/928 models have the clutch mounted to the back of the engine in a bell housing and the drive shaft from the clutch output, located inside of a hollow protective torque tube, transfers power to the rear mounted transaxle (transmission + differential).Thus the Porsche driveshaft only rotates when the rear wheels are turning as the engine-mounted clutch can decouple engine crankshaft rotation from the driveshaft. So for Porsche, when the driver is using the clutch while briskly shifting up or down (manual transmission), the engine can rev freely with the driver's accelerator pedal input, since with the clutch disengaged, the engine and flywheel inertia is relatively low and is not burdened with the added rotational inertia of the driveshaft. The Porsche torque tube is solidly fastened to both the engine's bell housing and to the transaxle case, fixing the length and alignment between the bell housing and the transaxle and greatly minimizing rear wheel drive reaction torque from twisting the transaxle in any plane. 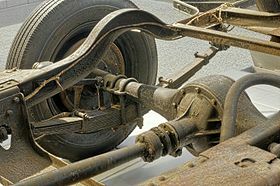 A drive shaft connecting a rear differential to a rear wheel may be called a half-shaft. The name derives from the fact that two such shafts are required to form one rear axle. The slip-in-tube drive shaft is a new type that improves crash safety. It can be compressed to absorb energy in the event of a crash, so is also known as a collapsible drive shaft. The automotive industry also uses drive shafts at testing plants. At an engine test stand a drive shaft is used to transfer a certain speed or torque from the internal combustion engine to a dynamometer. A "shaft guard" is used at a shaft connection to protect against contact with the drive shaft and for detection of a shaft failure. 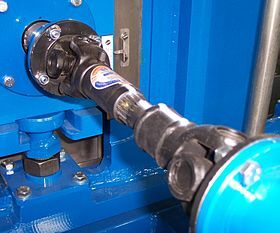 At a transmission test stand a drive shaft connects the prime mover with the transmission. Drive shafts have been used on motorcycles since before WW1, such as the Belgian FN motorcycle from 1903 and the Stuart Turner Stellar motorcycle of 1912. As an alternative to chain and belt drives, drive shafts offer long-lived, clean, and relatively maintenance-free operation. A disadvantage of shaft drive on a motorcycle is that helical gearing, spiral bevel gearing or similar is needed to turn the power 90° from the shaft to the rear wheel, losing some power in the process. BMW has produced shaft drive motorcycles since 1923; and Moto Guzzi have built shaft-drive V-twins since the 1960s. The British company, Triumph and the major Japanese brands, Honda, Suzuki, Kawasaki and Yamaha, have produced shaft drive motorcycles. Motorcycle engines positioned such that the crankshaft is longitudinal and parallel to the frame are often used for shaft-driven motorcycles. This requires only one 90° turn in power transmission, rather than two. Bikes from Moto Guzzi and BMW, plus the Triumph Rocket III and Honda ST series all use this engine layout. Motorcycles with shaft drive are subject to shaft effect where the chassis climbs when power is applied. This effect, which is the opposite of that exhibited by chain-drive motorcycles, is counteracted with systems such as BMW's Paralever, Moto Guzzi's CARC and Kawasaki's Tetra Lever. On a power-driven ship, the drive shaft, or propeller shaft, usually connects the transmission inside the vessel directly to the propeller, passing through a stuffing box or other seal at the point it exits the hull. There is also a thrust block, a bearing to resist the axial force of the propeller. As the rotating propeller pushes the vessel forward, any length of drive shaft between propeller and thrust block is subject to compression, and when going astern to tension. Except for the very smallest of boats, this force isn't taken on the gearbox or engine directly. Cardan shafts are also often used in marine applications between the transmission and either a propeller gearbox or waterjet. The portion of the prop shaft which connects directly to the propeller is known as the tail shaft. The Shay, Climax and Heisler locomotives, all introduced in the late 19th century, used quill drives to couple power from a centrally mounted multi-cylinder engine to each of the trucks supporting the engine. On each of these geared steam locomotives, one end of each drive shaft was coupled to the driven truck through a universal joint while the other end was powered by the crankshaft, transmission or another truck through a second universal joint. A quill drive also has the ability to slide lengthways, effectively varying its length. This is required to allow the bogies to rotate when passing a curve. Cardan shafts are used in some diesel locomotives (mainly diesel-hydraulics, such as British Rail Class 52) and some electric locomotives (e.g. British Rail Class 91). They are also widely used in diesel multiple units. Drive system is less likely to become jammed. The rider cannot become dirtied from chain grease or injured by "chain bite" when clothing or a body part catches between an unguarded chain and a sprocket. Lower maintenance than a chain system when the drive shaft is enclosed in a tube. More consistent performance. Dynamic Bicycles claims that a drive shaft bicycle can deliver 94% efficiency, whereas a chain-driven bike can deliver anywhere from 75-97% efficiency based on condition. A drive shaft system weighs more than a chain system, usually 0.5–1 kg (1–2 lb) heavier. Many of the advantages claimed by drive shaft's proponents can be achieved on a chain-driven bicycle, such as covering the chain and gears. Use of lightweight derailleur gears with a high number of ratios is impossible, although hub gears can be used. Wheel removal can be complicated in some designs (as it is for some chain-driven bicycles with hub gears). Drive shafts are one method of transferring power from an engine and PTO to vehicle-mounted accessory equipment, such as an air compressor. 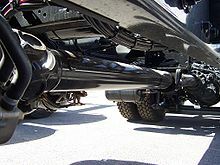 Drive shafts are used when there isn't enough space beside the engine for the additional accessory; the shaft bridges the gap between the engine PTO and the accessory, allowing the accessory to be mounted elsewhere on the vehicle. Nowadays new possibilities exist for the production process of drive shafts. The filament winding production process is gaining popularity for the creation of composite drive shafts. Several companies in the automotive industry are looking to adopt this knowledge for their high volume production process. ^ Henry D. Stover, Improvement in Wood-Planing Machines, U.S. Patent Reissue 1,190, May 21, 1861. ^ Henry D. Stover, Planing Machine, U.S. Patent 30,993, December 18, 1860, 1861. ^ John DeLancy Watkins and Robert Bryson, Mowing Machines, U.S. Patent Reissue 1,904, July 23, 1861. ^ Rush S. Battles, Locomotive, U.S. Patent 455,154, June 30, 1891. ^ Walter Stillman, Bicycle, U.S. Patent 456,387, July 21, 1891. ^ Dudley D. Bukey, Horse-Power, U.S. Patent 631,198, August 15, 1899. ^ Charles Clark, Marine Velocipede, [U.S. Patent 637,547], November 21, 1899. ^ "Autocar automobile". National Museum of American History. Retrieved November 19, 2017. ^ "Lambretta Scooters Models". Cambridge Lambretta Workshop. UK. Retrieved August 26, 2016. ^ "NSU Prima sales brochures". NSU Prima. Retrieved August 26, 2016. ^ "Wärtsilä Encyclopedia of Marine Technology". ^ "What Is A PTO Driven Air Compressor?". VMAC. March 15, 2019. Retrieved March 25, 2019.